The explosion was the second most powerful airburst of the 21st century. NASA's Terra satellite captured this image of the fireball that exploded over the Bering Sea on Dec. 18, 2018. Satellite photos give a striking look at the second most powerful meteor explosion of the 21st century. On Dec. 18, 2018, an incoming space rock detonated 16 miles (26 kilometers) above the Bering Sea's icy waters, generating 173 kilotons of energy. That's about 10 times more than the amount unleashed by the atomic bomb the United States dropped on the Japanese city of Hiroshima during World War II, NASA officials said. Unlike the Chelyabinsk event, nobody on the ground saw or recorded the Bering Sea meteor, as far as we know. That's a consequence of the remote location; the Bering Sea lies between far eastern Russian and Alaska. But some sharp eyes in the sky did preserve the blast for posterity. NASA's Earth-observing Terra satellite, for example, spotted the meteor with two different instruments — the Multi-angle Imaging SpectroRadiometer (MISR) and the Moderate Resolution Imaging SpectroRadiometer (MODIS). MISR team members combined some of their imagery into an animated GIF, which NASA released Friday (March 22). 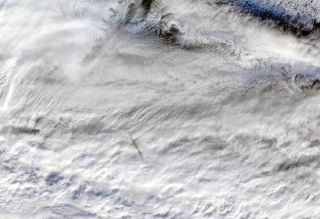 This image sequence shows views from the Multi-angle Imaging SpectroRadiometer instrument on NASA’s Terra satellite, taken a few minutes after a fireball exploded over the Bering Sea on Dec. 18, 2018. Japan's Himawari satellite also observed the blast. You can see some of that spacecraft's photos in this Sky & Telescope story. The object that caused the Bering Sea fireball was probably about 33 feet (10 meters) wide and weighed about 1,500 tons (1,360 metric tons), according to NASA meteor experts. The rock likely hit Earth's atmosphere going about 71,600 mph (115,200 km/h). Scientists think the Chelyabinsk asteroid was about 65 feet (20 m) wide at the time of its dramatic encounter with Earth. That object's explosion unleashed a whopping 440 kilotons of energy. But that output pales in comparison to a 1908 airburst over Siberia, which involved an asteroid thought to be about 130 feet (40 m) wide. This explosion, known as the Tunguska event, generated 185 times more energy than the Hiroshima bomb and flattened about 800 square miles (2,000 square kilometers) of forest. It's the most powerful impact event in recorded history. And no, the gods don't have anything against Russia. Russia gets walloped by space rocks so much simply because it covers more area than any other nation.